1. HOW DO I PICK UP MY TICKET(S)? 2. WHERE IS THE DANCE LOCATED? 3. IS THERE NEARBY PARKING? 4. WHEN DOES THE BOX OFFICE OPEN? 5. WHAT IS THE SCHEDULE OF THE EVENING? 6. WHAT SHOULD I WEAR FOR THE HOLLYWOOD CANTEEN THEME? 7. WHAT IS THE REFUND POLICY? 8. HOW MUCH ARE TICKETS AT THE DOOR? 9. WILL THERE BY FOOD AND DRINK THERE? 10. WHAT WAS THE HOLLYWOOD CANTEEN? 11. WHAT IS THE MAYFLOWER BALLROOM'S HISTORY? 12. MAY I SEE A CLIP OF YOUR LAST EVENT? 14. WHERE CAN I GET A WWII UNIFORM? 14. WHAT IF I HAVE MORE QUESTIONS? HOW DO I PICK UP THE TICKET(S) I ORDERED? Your name will be at door. Our box office will open at 6:00, so feel free to arrive any time after that. If you order by Paypal, may we recommend that you print out your receipt and bring it to the dance. WHERE IS THE DANCE LOCATED? There is also loads of street parking. The Box Office will open at 6:00pm. WHAT IS THE EVENING'S SCHEDULE? Our theme is "A Night The Hollywood Canteen." WWII Military attire (Allied Forces! ), and 1940's style cocktail attire for civilians. Of course, we would welcome any 1940's celebrities, should you choose to attend and do your bit. Please, no casual attire. Let's make this a truly special event. Event Refund Policy: Sorry, no refunds unless an event has been canceled or postponed by Rusty Frank. Event Cancellation Policy: Rusty Frank reserves the right to cancel this event due to circumstances which would make the event non-viable. If Rusty Frank cancels the event, ticket purchasers will be offered a full refund. Should circumstances arise that result in the postponement of an event, ticket purchasers will have the option to either receive a full refund or use their tickets for the event at the new, future date. HOW MUCH ARE TICKETS AT THE DOOR? Tickets at the door will be $35. WILL THERE BE FOOD AND DRINK THERE? There is a full cash bar and roving wait staff to take your orders. Make sure to eat before you get there (or a late super after?). 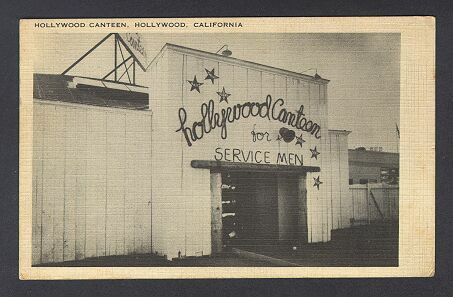 WHAT WAS THE HOLLYWOOD CANTEEN? 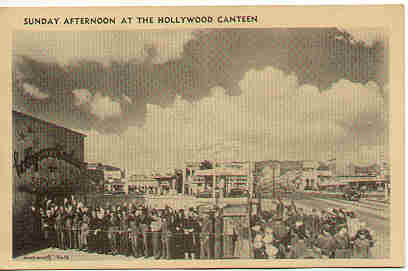 The Hollywood Canteen operated at 1451 Cahuenga Boulevard in Hollywood, California between October 3, 1942 and November 22, 1945 (Thanksgiving Day) as a club offering food, dancing and entertainment for servicemen, usually on their way overseas. Even though the majority of visitors were U.S servicemen, the Canteen was open to servicemen of allied countries as well as women in all branches of service. The serviceman's ticket for admission was his uniform and everything at the Canteen was free of charge. The driving forces behind its creation were Bette Davis and John Garfield, along with composer Jules Stein, President of Music Corporation of America, who headed up the finance committee. Bette Davis devoted an enormous amount of time and energy to the project and served as its president. The various guilds and unions of the entertainment industry donated the labor and money for the building renovations. The Canteen was operated and staffed completely by volunteers from the entertainment industry. By the time the Canteen opened its doors, over 3000 stars, players, directors, producers, grips, dancers, musicians, singers, writers, technicians, wardrobe attendants, hair stylists, agents, stand-ins, publicists, secretaries, and allied craftsmen of radio and screen had registered as volunteers. Glamorous stars volunteered to wait on tables, cook in the kitchen and clean up. 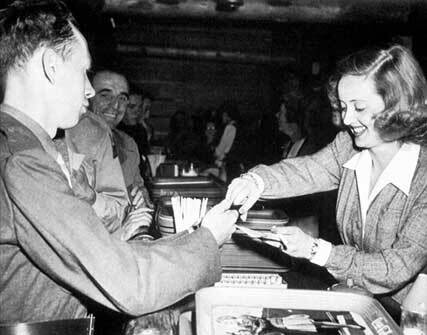 On September 15, 1943 the one millionth guest walked through the door of the Hollywood Canteen. The lucky soldier, Sgt. Carl Bell, received a kiss from Betty Grable. A Hall of Honor at the Hollywood Canteen had a wall of photos which honored the film actors who served in the military. Most of those actors, while on shore leave, came out to help the Canteen. WHAT IS THE MAYFLOWER BALLROOM' HISTORY? 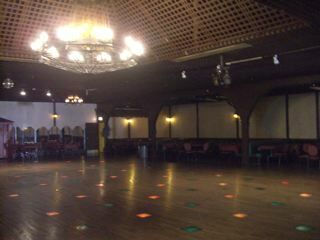 The Mayflower Ballroom was first opened in 1947. 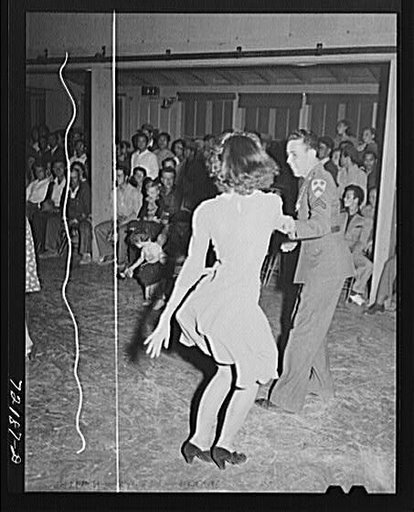 In its long life, it has been used not just as a ballroom, but as a USO facility and even as a skating rink! 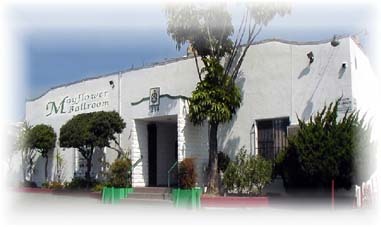 For more than 35 years, The Mayflower Ballroom has been the best place to dance in the Los Angeles area. Straight out of the "Big Band Era" the Mayflower is actually the only original, freestanding Ballroom left in Southern California." The Mayflower Ballroom has one of the largest hardwood dance floors in Southern California - 9,000 square feet. Thousands of dancers have spent hours in this ballroom, dancing on the giant wood floor with built in lights, under revolving mirrored balls and chandeliers. MAY I SEE A CLIP OF YOUR LAST EVENT? AND HEAR THE WONDERFUL MUSIC OF THE BILL ELLIOTT SWING ORCHESTRA! We would love to see as many WWII uniforms as possible. But if you don't want to wear one, fellows just wear a nice Hawaiian shirt and slacks or a suit and tie. Ladies, you can wear any 1940's style dress. For example, a floral print dress, a cocktail dress. Makes sure to have flowers in your hair and the red lipstick on your lips! WHERE CAN I GET A WWII UNIFORM? Rusty, an excellent place to find WWII uniforms is eBay. You need to know your measurements and be willing to be patient in order to find the right item, but I get most of my clothes, civilian and military, there. Fedora Lounge is also a great place for advice on all things vintage. Feel free to forward my e-mail to anyone that needs any advice. Here is the web site some of your Track students were asking about. They sell spot on recreations of US Navy and Army WWII uniforms. I'll stick a note in my wallet with the info and bring it to class as well. Maybe you could add this as one of the links of the week. They are a reliable company right here in SoCal! Thanks! This store will sell or rent you a uniform! Check it out. Some other ideas for attire at this dance would be pretty dresses for the girls (flowers in the hair, and, of course, red lipstick). For men, why not a nice Hawaiian shirt and slacks... a popular outfit for men in So Cal during the time. Feel free to contact us by email or phone 310.606.5606 before 2:00pm on the 16th.